Visit the Historic Medovue Estate … and Stay Awhile! English Inn Restaurant and Pub is much more than just a great place to eat, drink, and stay, it’s also the historic Medovue Estate of Irving and Janet Reuter. We recently talked about the R.E. Olds Transportation Museum in Lansing without mentioning an important connection between Oldsmobile and English Inn Restaurant and Pub: the home was built in 1927 by Irving Reuter who, at the time, was General Manager and President of the Oldsmobile Corporation. Irving Reuter came to Oldsmobile through a 1918 merger between the automotive manufacturer and Remy Electric Co., where Reuter had done very well for himself. By 1925, Reuter was made General Manager of the Olds Motor Car Co. and, shortly thereafter, construction was begun on the opulent estate. Named “Medovue” by the Reuters, the 10,000 square foot, two-story, cross-gabled, Tudor Revival house is L-shaped and sits on 15 acres with both annual and perennial gardens, an artesian well, swimming pool, fishpond, and nature trails, all of which overlook the Grand River. Beyond appointments like marble, slate, and Honduran mahogany, Reuter had a gifted mind for electronic gadgetry and he brought some of that know-how into his new home. Open a broom closet door at English Inn and, even almost 90 years later, the light comes on automatically, just like a refrigerator. Better yet, a button secreted in the vanity of what was once Janet Reuter’s dressing room slides back a secret panel over the bedroom fireplace – the perfect place to stash your valuables … or perhaps a bottle or two during prohibition. The Reuters moved on after the mid-thirties, selling the estate to Charles Holden who, in turn, sold Medovue Estate to the Roman Catholic Church just a few years later in 1940. Archbishop Joseph H. Albers, first Bishop of the Diocese of Lansing, used the home as his private residence. Albers must have had some misgivings about his lush quarters, however, as he chose Reuters’ walk-in closet for his bedroom, rather than the other, more ornate and spacious rooms. A cross he put on the ceiling of the closet, directly over where his bed stood, is still there. It is said he also transformed the pub’s oak bar into an altar. 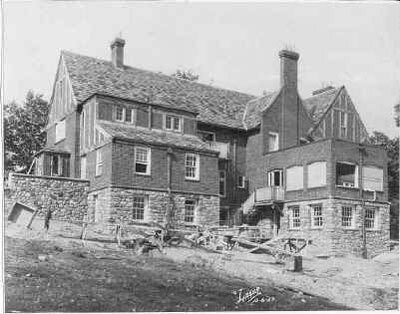 The property served briefly, in 1957, as a school for the gifted called Youth Unlimited and staffed by Albion College. In 1989 the property was purchased from the Roman Catholic Church, renovated and renamed “Dusty’s English Inn”. A few short years later, Medovue Estate was added to the State Register of Historic Sites. In 1996 the Nelson’s bought the property, shortened the name to “The English Inn,” and that brings us up to date. Whether you know it as Medovue Estate, The English Inn, or any of the other names the property has had since 1927, the luxury and style of the home that Irving Reuter built remains and you can experience it first hand. Come stay with us and see! I saw the segment on Under the Radar Michigan this past week and The English Inn is beautiful! Without making a reservation, can the inn and grounds be toured? I had lunch at the English Inn today and what a blessing that was. The service was outstanding and so was the food. It was exciting touring this historical site. That was my first visit, but definately not my last. May God continue to bless you as you continue to bless us. Irving and Janet Graham Reuter were my great aunt and uncle. Janet was a sister to my great grandfather, Orval Graham. She was born in Ripley County, Indiana, the daughter of George and Sarah Robbins Graham. I’ve researched the Graham families for years and have researched the Reuter family a little. I hope to visit “Medovue” next summer and hopefully get pictures to share with family members. Sounds quit promising. I’d like to know if possible if The English Inn is comparable to Downton Abby? I would love for my family to experience the elagence of The English Inn.